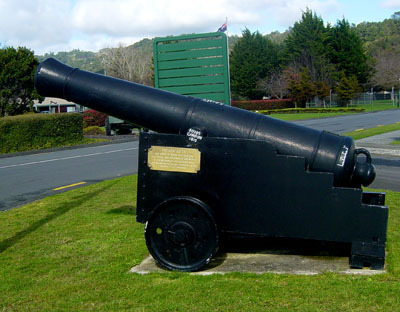 Both ex-Johnsonville cannons are located at Trentham Military Camp and have been identified as '24 pounder' Carron-manufactured artillery weapons. 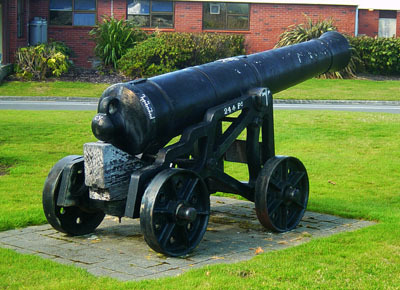 In 2009 and 2010 I made several visits to Waiouru and was unable to find the Johnsonville cannons located there. 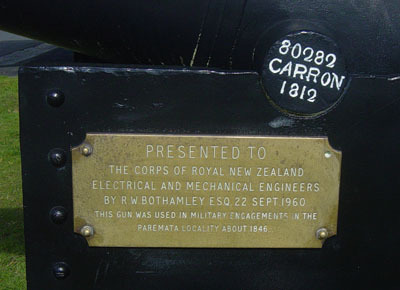 In 2010 I met Major Magnus Latta of the 1st (New Zealand) Military Police Company and asked if he knew of any cannons at Trentham that may have been donated by a Mr Bothamley with a plaque recording the donation. 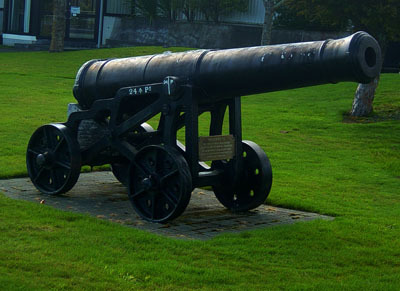 He said he was aware of one beside the Church inside the entrance gates.He invited me out to the Camp and I subsequently met with Sergeant Jo Healey, who allowed me to photograph this cannon. He took me a couple of hundred yards away to where the other was located. “Presented to the Corps of Royal New Zealand Electrical and Mechanical Engineers by R. W. Bothamley Esq. 22 Sept 1960. The next section in this article describes a cannon ball found on Middleton Road where the gun wagon rolled - Claire Bibby, Glenside.